"For me the highlight of the year has been the trip to South Africa. After winning the Nora Cup for the first time I thought the year wasnt going to bring me anything more exiting, but I was completely wrong! Going to South Africa has change my way of thinking as a person. It's such a nice country where all races have learnt to live and grow together in harmony. The mix of cultures is what makes a country rich! And this is the experience that I have witnessed. 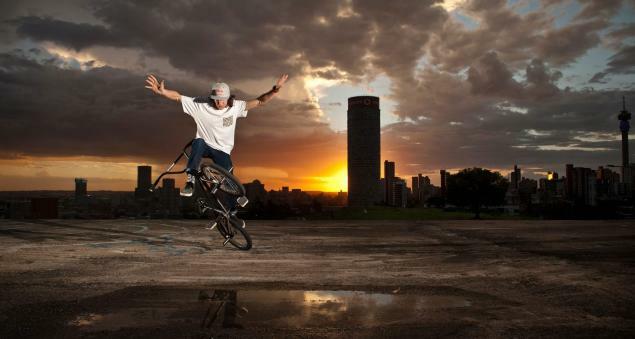 People love BMX in South Africa! They really appreciate it and understand the roots of it, the streets! Traveling with Matthias this year has been so amazing! We have become a super good team and this last trip was a reward for our success and effort in 2013! We have something in common and it's that we want to ride all the time. For me this is incredible cause we are pushing each other big time. I have learnt a new trick that will be shown soon at the sevisual edit filmed recently in Japan during the G Shock Real Toughness contest. I call it the "Durban Lion" cause I learnt it in Durban football stadium during a photo/video session where I was wearing a t shirt with a huge Lion head on it. It is a great memory that I take with me out of the uncountable memories list from what has been the best trip of my life! Check the videos and experience by your self! Enjoy it!" Red Bull covered almost every minute of the South Africa tour on their website. Besides that there were a ton of Viki videos this year and we tried to select some of the highlights. Please leave a comment if we missed something.